Welcome to Poco Lobo, your home away from home! Our professionally decorated home features beautiful, comfortable furnishings, flat screen tvs with over 100 channels, a kitchen stocked with everything you'll need, wonderful pillowtop mattresses with premium sheets and bedding. Step outside and enjoy the covered patio, hot tub, pool and water feature, or relax on chaise lounges on the flagstone patio. Soak up the Arizona sunshine, or raise the umbrella and nap in the shade. Watch the colorful sunsets as you bar-b-que on the gas grill, or simply relax with a glass of wine . You may not want to leave the house and back yard! Please take a look at our other two homes - Property ID 136489 and Property ID 183776 located in the same neighborhood and Property ID 365848 located in Oro Valley. The master bathroom has dual vanities and a separate tub and shower. The second bathroom has a tub/shower combination. Wonderful Pebble Tech pool with water feature. This pool does not have a heater for winter use. 6 person hot tub that is always ready for use - 24/7. My family recently stayed at Todd and Stacey's Poco Lobo property in order to attend a family wedding. It was the perfect location! Their home was spacious, well maintained and beautifully arranged. The kitchen was well equipped such that we were easily able to make breakfast casseroles and easy lunches for our group. We even grilled out on the grill by the pool! The pool was clean although too chilly in early April to swim, except for the bravest of our clan. We did use the hot tub while we were there and enjoyed the mountain views from that perspective. It was wonderful to come home to very comfortable beds after dancing all evening at the wedding. We felt safe in the home and neighborhood, especially with the extra locks on the sliding glass door to the dining overhang and pool area. We will definitely return to Poco Lobo whenever we are in the Tucson area! You are most generous in your Review. Thank you very much. This home seems to be the favorite among our guests. I like Club Wolff West personally and Stacey likes Blue Wolff Resort the best. You may have to try them all. So glad all went well and you were able to enjoy our fantastic weather. Come back soon. Everything was wonderful for our stay in Tucson. Another great property by the Wolffs! Two years ago we stayed at another property owned by the Wolff's and we loved the house, again, they did not disappoint! The kitchen is fully stocked, the home is comfortable, beds are great and the hot tub became our evening ritual. 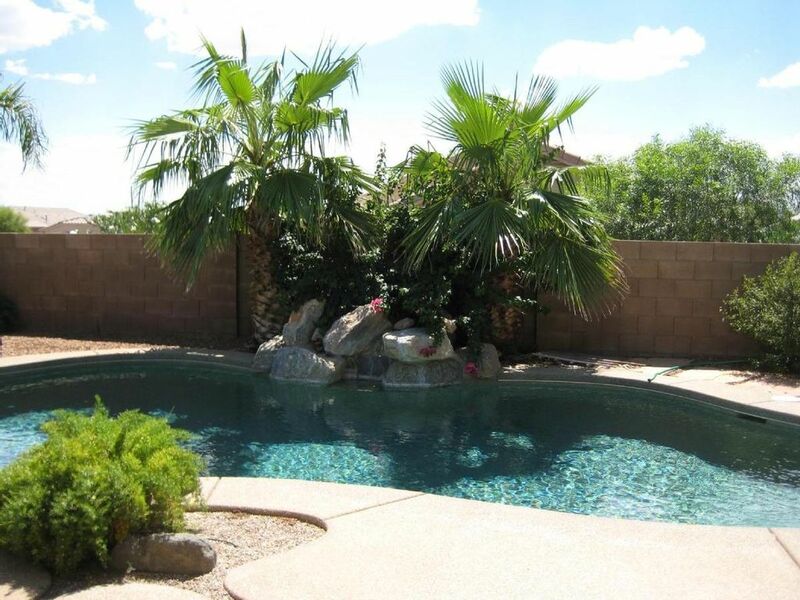 You are located very close to Tucson National Golf Course and a wonderful trail to walk or bike. Don't be alarmed by the loud garage door or wash machine, both work just great! We enjoyed grilling our own food and relaxing in the back yard. There were only 2 of us, but this would be perfect for a family or small group of couples. Thanks for a great vacation! You're going to wind up staying at all of our vacation homes before it is all said and done! Thank you for another incredible Review. We are very grateful and try to make our homes as inviting as can be. Please give us a call when you are ready to return. Common space and seating worked well for 3 couples. The street at the side of the house had a steady flow of traffic. One of the best stocked homes we have ever stayed in. Great location in Oro Valley by stores and good restaurants. Todd is a consummate host. Thank you for the great Review. We try. So glad you liked the home. The location is hard to beat. Poco Lobo is absolutely the perfect place to stay in Tucson. The house is beautiful, well equipped with everything you need. The gas fireplace is awesome during the cold mornings and evenings. The pool and hot tub are nice. Todd is the perfect host, and always available to answer questions. Thanks so much Stacey and Todd. We hope to return next December. I encourage you to call us quickly for next December. Our homes fill up fast. See you next year and have a Happy New Year. We are conveniently located in northwest Tucson, with golf, tennis, hiking, fine dining, shopping and much more all nearby. While in Tucson you may want to visit Sabino Canyon, Mount Lemmon, Tohon Chul Park, The Arizona-Sonora Desert Museum, Old Tucson Studios, San Xavier del Bac Mission, Pima Air and Space Museum, Kitt Peak National Observatory, or Biosphere II. Easy day trips include Bisbee, Tombstone, Kartchner Caverns, Tubac artists' community, Tumacocari, Mexico or Phoenix. Gem show rate is $1295.00 per week January 31, 2015 - February 14, 2015 Please view our other homes - #136489 and 183776.